Whenever you have to choose a password, either for online services or any type of account, try to create it by mixing up letters and number. Avoid installing unknown software suggested by unfamiliar websites. The third goes with the second, do not download or install programs, games, screen-savers or wall papers that you are unfamiliar with. Do not open E-mails attachments that you are not certain of their origination. Do not allow kids or for that matter anyone to play around on your PC unless you are doing so in a controlled environment. Do not illegally download or visit sites that offer illegal software or movies/music as this is illegal. These websites will also attempt to infect your computer with unwanted software. Always keep your PC updated with the newest patches and security updates from Microsoft. Also make sure that you have the latest version of your usual productivity software. When it comes to hardware, try to keep your computer in a clean and properly ventilated environment. Make sure to install a good Anti-virus software and keep it updated with the latest Virus Definitions. A good firewall program will sometimes help avoid any issues that may arise in the World Wide Web. Also, keep in mind that most firewalls will interfere with the normal operation of programs and utilities. Make sure to back up your most important files on a regular basis, it will save many headaches. 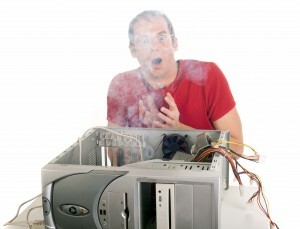 If these simple steps become routine, you will avoid most basic PC problems.